Northern flickers are a medium sized woodpecker, measuring about 13" in length. They have very distinctive plumage with black spotted breasts and black barring on their backs. Male flickers have a wide black "moustache" stripe and both males and females have red crescent markings on the backs of their necks. 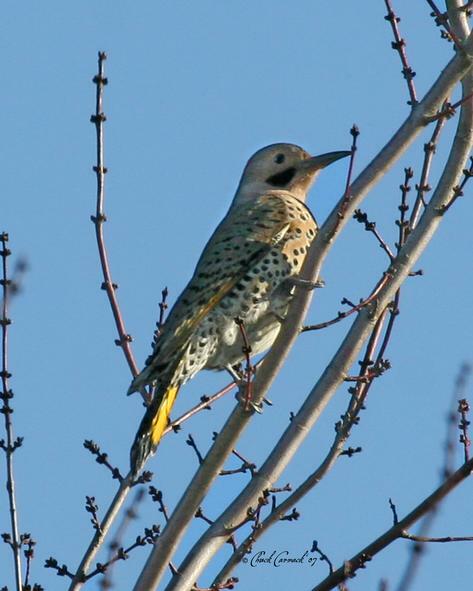 The eastern flicker population is called yellow-shafted due to the yellow feathers under their wings and tails. Western flickers are red-shafted. The two populations may hybridize to produce flickers with orange feathers. Northern flickers are cavity nesters. They build their nests in holes in trees. Range: Northern flickers can be found throughout the contiguous United States and Canada. Unlike most woodpecker species, northern flickers are migratory. More northern populations move south during the winter. Flickers live in woodlands, forest edges, and swamps, as well as parks and suburbs. Diet: Flickers spend time on the ground searching for ants to eat. They also eat peanuts, seeds, and fruit. They will feed at tube, tray, ranch-style, and suet feeders. At Wild Bird and Garden we have foods that northern flickers love like our Woodpecker Favorite seed mix with peanuts, suet, dried fruit, and sunflower hearts.